I'm shopping for new windows for my home and have found that I can have vinyl windows installed at the best price. They also have really good product warranties. It seems like a good buy, but are there any alternatives that I should consider? Answer provided by: Philip Eby, Owner, Eby Exteriors, Inc.
You're right in that vinyl windows can typically be bought at the lowest price (Although I am amazed at how much some companies are charging for their vinyl windows these days!). Many companies also do offer good warranties with them. However in the world of windows, as is so often the case with most products, the lowest price is rarely the best value. While most vinyl windows are great when they're new, our experience has taught us that they are much more susceptible to some long–term problems that often begin to appear after about 8–10 years (sometimes less). Those problems include: seal failure which leads to fogging between the glass, expansion and contraction which can lead to both air infiltration around the window and in the window itself, and expansion and contraction which prevents the window from opening and closing properly. Another problem with vinyl windows that most people don't realize until it's too late is their lack of strength. In order to build their windows to be strong enough to support glass and properly operate, vinyl window manufacturers have to make the frames of their windows exceptionally wide. What this means for you is a loss of visible glass space. We've often heard from consumers who were disappointed with how much smaller their new vinyl windows were compared to what they had. The other thing we've learned, since you mentioned warranties, is that vinyl windows have become more and more of a commodity. In the last 10 years we've seen an increasing number of vinyl window companies come and go through buy-outs, mergers, bankruptcy, etc. Many companies don't even manufacture their own windows but pay someone else to do it for them and then put their label on them. Warranties are only as good as the company that offers them and if you buy vinyl windows today, there is a significant chance that in 10 years the company you bought them from won't be around to honor the "lifetime" warranty they sold you. A great alternative to vinyl windows that we've found is a fiberglass unit. Fiberglass is exceptionally strong. In fact, the "Integrity by Marvin" product that we prefer uses a fiberglass called "Ultrex" that is 2X stronger than steel. This fiberglass is the same type of stuff used to build things like boats and ladders. You'll never see a vinyl ladder. What this means for you is that you're buying a window that has a narrow frame so you don't lose glass space, and keeps its' shape so that it operates as well in year 20 as it did when it was new. It's also much less susceptible to the air infiltration issues that plague vinyl units. Furthermore, because fiberglass is virtually as stable as glass itself, the issue of fogging between the glass is almost non–existent. We also prefer the "Integrity by Marvin" unit because its' warranty is backed by the Marvin Company. Marvin is family owned and has been in business for over a hundred years, so in the unlikely event that you do have a problem there is a solid company standing behind the product. Typically (but not always) you'll spend more to buy a fiberglass window. However, we've found that the product is more than worth the extra cost, making it a great value. If your budget simply doesn't allow for the extra cost, make sure that you buy the best vinyl window that you can afford and if possible buy a product manufactured by a company that's been making their own windows for many years. Feel free to call us at 733.9142 if you'd like more information or come visit us at our Akron showroom. We'd also be happy to visit you at your home or place of business. And, as always, we offer free, no obligation quotes. I just bought a beautiful older home that will require some upgrades, including replacement windows. What can you tell me that'll help make me a more informed consumer? 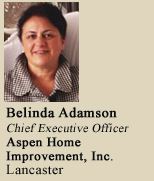 Answer provided by: Belinda Adamson, Chief Executive Officer, Aspen Home Improvement, Inc.
Tax Credit. First off, your timing is still good–there are tax credits available through 2013. A $200.00 tax credit is available on replacement windows with a U–value of 0.30 or less. Remember the lower the U–value the more efficient the window. With good quality windows using dual pane glass you should look for a U–value of around 0.25. For triple pane windows, look for no more than 0.19. Price Range. Fully–installed replacement windows will range from $250 to $1500 per window. As you would expect, the huge cost difference reflects a huge quality difference. Choosing a Company. We recommend choosing a local company with a local showroom who has their own installers– no sub–contractors. Look for a company with a track record – the more years of experience the better–and a company who can give you client referrals and testimonies. Choosing the Right Window. In addition to its U–value, check into how it is insulated. Check on the quality of the materials and components, including those you cannot see. Look at the outside of the windows where the screens are. The visual appearance of the window vary enormously. We talk a lot about the U–value of windows but don't forget to take a look at the extrusion. A good quality window is always foam insulated giving an extra 10 percent saving on overall performance. Lastly, and very, very important, check on the warranty. Dual Pane v. Triple Pane. You will pay approximately $120 per window more for triple pane but in terms of energy savings they are approximately 20 percent higher than the dual pane savings. Custom v. Stock Windows. Custom windows (in contrast to pre–made, standard sized windows available at home centers and lumber yards), maximize the performance of your windows. With custom windows, you have many more options to choose from. In addition, because they are custom sized, they will be a tighter fit to fill your window pockets. Vinyl v. Other Window Material. Other than occasional cleaning, vinyl and composite windows are totally maintenance free. In addition, they are less conductive and much more thermally efficient. In my opinion, the most advanced window that can be purchased today is a solid extruded composite window with triple pane glass giving you a Uvalue of 0.15. For more information, feel free to contact us at 717.569.3700 or email us at aspenwindows.com. There is no charge for an informational visit to our showroom or your home, including a free estimate. In terms of replacement windows, just how important is the warranty? Homeowners are becoming overwhelmed, (or is it underwhelmed), with home improvement companies' bait and switch tactics when it comes to the warranty. The bold print seems to give while the fine print takes it away. Understanding the specifics of your warranty is imperative to your decision to improve or replace anything in your home. Mainly the reason for surfacing these concerns is that our company is steadily replacing more replacement windows than wooden or metal. This is because the homeowners were led to believe they had a lifetime warranty. In the end, these homeowners have another new window, home improvement company, manufacturer and yet another warranty. How will you know if you have the right warranty for you and for the job? The warranty is a guarantee by a seller to a buyer that if a product requires repair or remedy of a problem within a certain period after its problem at no cost to the buyer. The warranty is part and parcel of the contract of sale. What kinds of warranties are out there? Which one should I look for? What are the differences? Does my warranty stay with the house if I move? Unlimited or Lifetime Warranty — best warranty to have! Repair or replacement is not constrained by time or dollar amount. No constraints. Limited Warranty — specifies under what conditions and to what extent product is guaranteed to work as claimed, and the time and monetary limits for repair or replacement. Pro–Rated — under an extended period of time will never cover total cost of repair or replacement, only a portion. The percentage of what is covered diminishes over time. Transferrable — home improvements sometimes make the warranty transferrable which can be a great resale point to the value of your home. An extended warranty fee is always incurred by the new owner of the property, but the original terms of the contract are not altered. What it all comes down to is to be certain that you read the entire warranty and understand the liability of the installing company and the manufacturer and to know how to hold these two entities accountable. Be sure to have solid and updated contact information for everyone from your sales rep, the company they work for, and the manufacturer of what you are purchasing. Be sure to have all documentation necessary to hold all accountable to stand behind their product and/or its installation. Do your own research. If you need any further information, or have comments to share concerning this information, feel free to contact us at (717) 569-3700 or email us at aspenwindows.com. I would like to purchase custom shutters for my home, but I am confused about all the different types available. Can you help me? This is a very common question I hear from my clients. Lets start with the types of shutters that are available today. First are real wood shutters made from solid basswood. These shutters are the lightest in weight, which will give you more choices in panel sizes and the ability to hinge more panels together for large windows. Painted or stained they offer the most genuine custom look available. Next are composite shutters made from recycled wood with a fine tech coating. This finish will eliminate the possibility of fading, warping, splitting or peeling — since they weigh more than a traditional wood shutter you may have fewer options when considering them for larger windows. And then there are vinyl shutters. The best ones are made with an aluminum "inner" frame structure and then wrapped with an outdoor grade poly satin material. These shutters are great for beach homes or bathrooms that have high moisture situations. Colors are limited to whites and off whites. Definitely the most durable shutter on the market. Which louver size will be best for my home? By consulting with a professional window treatment specialist they can guide you to make this decision with you, based on the architectural style of your home along with the style of décor inside your home will play a key role of selecting a louver size. Generally a client will choose a larger louver size if they decorate in a very modern style. Larger louvers will also offer the "best view" through the window and provide a cleaner, less busy look. More traditional style homes will look best with a 2 ½" – 3 ½" louver size. The trend today leans more toward a 3 ½" louver. If you have a very colonial style home or enjoy a more primitive style décor we will suggest a 1¼ " – 2 ½" louver size. What are some of the choices based on functionality? Shutters by nature are the most versatile window treatment on the market today. They are inherently room darkening while also giving you the ability to adjust the louvers to allow different amounts of light into the room. You can also opt for adding a "divider rail" traditionally placed at the lock level on double hung windows. This will give you the ability to open or close the louvers above or below this rail to control the desired privacy level you need. Another choice is whether or not to have a "front" tilt bar, which gives you a true traditional looking shutter. There is also a hidden tilt option, which is attached behind the shutter panel, giving you a more unobstructed view and allowing for easier cleaning. By enlisting the help of a certified shutter professional, they can help you choose the best styles, features, options and colors to ensure that you will achieve the look AND function you will enjoy for years. At Grauer's Paint & Decorating, we have full–working displays to help you make the best choices to suit your windows. Call us at 394.0558 or visit our Lancaster Paint & Decorating Center, Mon. and Fri. 7–7, Tues. thru Thurs. 7–5, and Sat. 8–3. I know there is a tax rebate available for qualifying windows, but does the rebate also apply to a new entry door? Is there such a thing as an attractive security entry door? What do I need to look out for? Is a door a door? Yes, you can get a tax credit of up to $1,500 on both entry doors as well as patio doors. However, entry and patio doors will only qualify if they meet the 30/30 rule. That is a U-factor of 0.30 and a solar heat gain of 0.30. The style and the quality of an entry door will often determine whether or not it will make the grade. For example, many entry doors today with decorative glass units will not qualify since the manufacturer cannot incorporate Low-E glass into such a unit which is vital to a product to qualify. Many of your higher quality entry doors are not only the most attractive and well insulated but come with greater security features. Some of the features to look out for when shopping for a security door is the gauge of the steel surface—the heavier the gauge the better. Look for a security lock block located inside the structure where the knob-set and deadbolt are mounted on the door. Heavy-gauge steel reinforcement of the door frame and a multipoint locking system go a long way in making a door secure. As for making sure your new door will qualify for the tax rebate, just remember that a quality professional company will always show documentation stating which products do and do not qualify for the rebate. For additional information on energy efficiency tax credits go to www.energystar.gov or visit me at Aspen Home Improvements. By phone I can be reached at 569-3700. If Energy Star windows qualify for the new federal tax credit, then as long as they have an Energy Star sticker they qualify, right? WRONG! I wish I had a dollar for everyone who has asked me this question in the last few weeks. Unfortunately, there has been a huge misunderstanding and misinformation about this issue, so let me try and set the record straight to help you make an informed decision. Unlike previously, NOT all Energy Star labeled windows and doors qualify. In order to qualify for the new and improved tax credit, replacement windows and doors must have certified U–factors equivalent to or lower than 0.30 and a solar heat gain coefficient of 0.30 as well. This is important information for homeowners because at this point nearly 70% of vinyl replacement windows will NOT meet the tax credit criteria. For too long the market place has been flooded with substandard windows. These new tax credit requirements will force manufacturers to retool and manufacture better quality, more energy-efficient products. To meet these new criteria, some companies are adding an additional pane of glass or using double Low-E glass which may cause weight and aesthetic issues. If this is the route you are taking you really need to make sure you check out the warranty because more weight from the triple glass can cause balance and other problems and double Low-E gives a significant coloring on the glass. Do your home work. The lower the U-factor the greater the dividends you will receive on energy savings. These typically are products at the highest energy efficiency level such as the Pennsylvania-made Starmark cellular composite frame windows which are the #1 nationally-rated energy-efficient window in America as per Energy Star performance ratings. Starmark offers a 40% guaranteed fuel savings pledge and boasts a certified U-factor of 0.24 in double-pane glass and a 0.15 in its triple-pane version. For your own peace of mind and to be absolutely sure that your purchase will qualify for the new tax credit—GET IT IN WRITING! Do not take anyone's word for it. The National Fenestration Rating Council (NFRC) issues manufacturers with the ratings of their windows— ask to see the ratings. I’m amazed to hear about the number of homeowners who are experiencing window problems even though they just bought “Lifetime Warranty” windows. What's even more amazing is that, in many cases, it costs the homeowners to have them fixed. If Lifetime is LIFETIME, why do they have to pay? Remember back when you were house shopping and everyone preached LOCATION, LOCATION, LOCATION? Well, the motto for window shopping should be WARRANTY, WARRANTY, WARRANTY. And as many homeowners have experienced, warranties are not created equal. Of the many things that need to be considered when reviewing warranties, probably the most important is getting what's covered in writing. If you don't see it in writing, it most likely is NOT covered—despite what you hear from the salesman. I always thought that a more truthful way for a window company to address the warranty is to provide a “What's NOT Covered Warranty”. For discriminating window shoppers, such disclosure would eliminate nearly 80% of the window companies from consideration. Lifetime warranties or Limited Lifetime warranties usually only cover certain things. It's amazing how many shoppers rely on the salesperson's word rather than the specific language of the warranty. For many homeowners, the truth only comes out when it's too late. Unfortunately, too many honest and reliable window companies get tarred with the same brush when “Joe Shmow Company” misguides consumers. Lifetime warranties should always state what's covered. If it doesn't distinctly say “Cracking or Warping” it's not covered. While it's nice to hear a salesperson tell you that their windows won't crack or warp, if it's a true statement, why not put it in the warranty? Look also for labor in the warranty. Manufacturers are in no way responsible for care and installation of the product. Today many service issues are not the fault or failure of the window but are directly related to how the product was installed. Good warranties today will also offer some sort of workmanship- related coverage—in writing! Many contractors today will offer some kind of craftsmanship coverage but do not commit to it in writing. The benefit is clearly for the contractor. This gives the contractor the option to pick and choose which services he wants to address and which ones he wants to stay away from, typically the more expensive ones! If a contractor truly has quality craftsmen and offers to his customers the very best workmanship, why wouldn't he offer a Lifetime Warranty on his work? I hear all sorts of reasons, “If anything is going to go wrong it's within the first year”; hence a 1-year warranty on labor. Some even stretch it to 5 years. If it's truly quality workmanship, why not cover their work for life? Look for a warranty you can easily read. It shouldn't take you forever to read it and there should be no small print. At Aspen Home Improvement, our warranty is a one-page document that can be read in a minute or less. It clearly covers everything. Ask the representative of the company you are interviewing to let you have a look at their warranty. Do not purchase the product if you can't read it, understand it, and agree to it all. Take some time to go through this very important step. If need be, ask for a copy of the warranty and take it with you to read at your leisure. Don't be hassled or pushed into signing a contract if you are not completely comfortable with it AND the warranty. Should you have any window warranty questions, please do not hesitate to call us. Because manufacturers are always looking for competent companies to carry their windows, we have copies on file of most warranties. However, at Aspen Home Improvement very few manufacturers warranties meet our standards and, thus, we don't carry their products. If you call our office we will be happy to come out and go over any company's warranty with you. What is the one thing that a homeowner can do to reduce energy costs and increase value in their home? 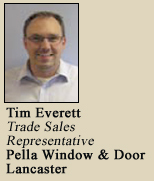 Answer provided by: Tad Shepherd, Regional Remodeling, Representative, Andersen Windows, Inc. They can replace their patio door. This is usually one area of the home that has one of the highest traffic uses and can also be one of the homes biggest energy losers depending on the type of door they have. After years of use these doors have a tendency to warp, stick, and deteriorate due to water damage or everyday use. And let's not forget the daily excessive heat gain or loss caused by early insulating glass panels. If your patio door falls into this category, replacing it is a sure and simple way to improve your home. The latest designs deliver both style and performance especially when it comes to energy efficiency. Choosing the right one will not only save you money in heating and cooling bills, but also enhance the architecture of your room, let in natural light, and open the space to any exterior views. If your current door happens to be unusual in size, that shouldn't be a problem either since most manufacturers have custom capabilities now as well. With such a wide range of options out there how does one go about picking “the right one”? Start by choosing a manufacturer with a brand name you can trust; one that offers time-tested, quality products and lasting warranty. Since patio doors are used often and subjected to inclement weather conditions, they experience a lot more wear and tear compared to other doors in the house. Before buying, make sure the manufacturer includes a good warranty and service network in case it's ever needed. • The type of glass used in a patio door can make an enormous difference in your energy bill. For example: installing patio doors with low-e glass, a transparent heat-reflective metal coating on glass, can reduce energy loss by 30 to 50 percent. Low-e glass also blocks UV rays that can fade fabrics and damage furniture. • Invest in products made from quality materials like clad wood panels and frames that provide strength and low-maintenance, and can resist the worst Mother Nature can throw at it. • For an added level of security, choose a hinged patio door that offers a multiple-point lock system that locks the top, bottom and center of the door in one motion. Look for manufacturers that feature hardware with adjustable door hinges, easy locking mechanisms and a wide choice in hardware styles and finishes including fashion options such as satin nickel, oil-rubbed bronze, bright brass and polished chrome. • Ideal for seasonal operation, retractable insect screens installed on the interior of hinged doors can, when not in use, neatly hide away into a small canister on the side of the door. Next, decide on a design. Regardless of whether you are updating your current doors or going with a completely different look, a patio door should reflect the style of the house while addressing a few practical concerns. It not only needs to be scaled to its surroundings, but should also be constructed of materials that are in keeping with the overall ambiance of the room. Gliding patio doors are a good choice when a projecting door would interfere with interior or exterior furnishings. Unlike the aluminum frames of yesteryear, today's gliding patio doors are available in a wide variety of contemporary styles in sleek thin frames, or for more traditional homes, space saving sliding French-styled doors in a classic wood design. When shopping for this type of door look for products with adjustable ball bearing rollers which help gliding patio doors feel like they’re floating, not sliding. Hinged or “French-style” patio doors are derived from an original 18th century French design called the casement door. Manufacturers have combined traditional craftsmanship with modern energy efficient technology to come up with a timeless classic, designed to fit into a wide range of architectural styles. These doors have framed panels, with at least one panel capable of swinging in or out like a conventional door. When the door is designed to swing out of the room, this style can save up to 28 square feet of interior space. As with all doors, this design should be positioned within the natural flow of traffic in and out of your home. With more and more homeowners concerned about energy, going green is no longer for old hippies and tree huggers. That's why before you buy, it's important to do a little homework regarding a company's environmental commitment. Look for products that have a Green Seal certification, proving that energy savings can be a beautiful thing. If you’re in the market for a new patio door then go to www.andersenwindows. com where Andersen can help you choose a door that is right for your home. 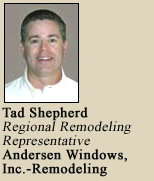 You can also contact me at Tad.Shepherd@andersencorp.com. The temperatures are getting cooler and we’re thinking about getting new windows. What features should we look for in a quality window? Buying a window isn't typically a one size- fits-all kind of process. No single solution is always right for every home or every climate. But you can count on Pella for the solution that's right for you. Few things enhance your home more than windows and doors. At Pella, we take care to use the right materials for each product to ensure they deliver outstanding performance year after year. Here are some key components to consider when purchasing new or replacement windows. Wood. Pella windows and patio doors offer the warmth and beauty of wood interiors. They are available in pine and can be painted or stained to match any decor. Mahogany, Douglas Fir or Alder interiors are also available. The exterior of Pella wood windows are protected by Pella's low-maintenance EnduraClad®, or EnduraClad® Plus, aluminum cladding system that doesn't need painting. Optional wood exterior is also available. Fiberglass composite. Pella® Impervia ® products are incredibly energy efficient and low maintenance. Made of a patented fiberglass composite called Duracast®, it's the strongest, most durable material available in windows and patio doors. Premium vinyl. Pella premium vinyl windows and patio doors offer a quality low-maintenance product with the overall value and energy efficiency you expect from Pella. State-of-the-art testing laboratory. For more than 80 years Pella has set the standard for quality. In our state of- the-art product-testing facilities, we continually test the components of Pella windows and patio doors under the harshest conditions—the burning rays of the sun, salt air, acid rain, excessive humidity, extreme hot and cold temperatures, high wind and driving rain. Pella tests for air and water infiltration and structural strength during the manufacturing process. These stringent measures ensure our windows and patio doors will perform the way we say they will. Pella products are also backed with one of the best warranties in the business. Energy performance. ENERGY STAR® was created to help consumers easily identify products, homes, and buildings that save energy and money, and help protect the environment. As the government-backed, trusted symbol for energy efficiency, the ENERGY STAR® label identifies highly efficient products and designates superior energy performance in homes and buildings. As ENERGY STAR® Partner of the year for 2 years in a row, we provide the data used by ENERGY STAR® to rate all of our windows and doors including the Solar Heat Gain Coefficient (SHGC) rating and U-values. The SHGC rating will tell you how effective the product is at blocking the heat caused by the sun (the lower the number, the less heat it allows in). U-values indicate how well the product keeps heat inside a home (the lower the number, the better it insulates). Pella's products offer some of the lowest U-values in the industry. Most Pella® products with Low-E insulating glass meet or exceed ENERGY STAR® guidelines in all 50 of the United States. In fact, we have some products that have U-values that significantly exceed U.S. ENERGY STAR® guidelines. Glass options. Different climates require different window technologies for best performance. We offer options ranging from standard clear insulating glass to energy-saving, Low-E insulating glass. Double- or triple-pane glass options with between-the-glass blinds or fabric shades can further increase energy savings and can even reduce outside noise — like lawn mowers and traffic. Pella Designer Series windows and patio doors with triple-pane glass are #1 for noise reduction and energy efficiency when compared to top national brands with similar glazing. How do I choose a window and window company and feel comfortable that I selected wisely? Secondly take a good look at the company warranty. Reviewing the warranty up front before a buying decision is made is a must. If you can not read the small print ask yourself “why is it so small?” The answer may be because they don't want you to read it. When you’re comparing different brands of replacement windows, the details of the warranty will be the indicator of the window quality and the company's willingness to stand behind their product. If it doesn't appear in writing in the warranty, why doesn't it? If it's covered by the warranty why isn't it in writing? Is it because it's simply not covered? Don't take the salesman's word on it—ask for it in writing. Aspen pays 100% of the costs of replacement parts and 100% of the labor for any work required on our White Knight Elite windows for the lifetime of the home—no matter how many times the house is sold. And it's in writing that you can clearly read. Too many companies justify their 1-year labor warranty by saying “If anything is going to go wrong, it's in the first year.” Not true! How many people do you know whose glass has fogged up or need a replacement part? Problems can occur after year one—and they do. Thirdly ask about the installers who will be doing your work. Are they salaried staff of the company or subcontractors? Did you know that if a subcontractor installs your windows and you pay the company, the installer can put a lean against YOUR house if he doesn't get paid by the company? It doesn't matter if you have paid or not. This is a huge risk to take. Make sure they have proof of insurance. If they damage your property or an accident happens to them while on your property they MUST have insurance. And last but not least—consider the product. If you made your selection based on the above points, the rest should be easy to figure out because the company couldn't offer an inferior product and still stand by its labor and product warranty. If they did, they would be losing money by running around fixing problems all day—for free! Most windows today have an Energy Star rating and most people think that's the only thing you should look for. Again, not true! Make sure you check out the window's drainage system and its welded insulated frames. The vinyl frame needs to be substantial. In our showroom, we have some samples of what NOT to buy. You may be able to poke a pencil through a fiberglass screen, but should it tear simply by running your finger nails across it? Look for anodized aluminum screens which are much stronger and don't rust. In short, to ensure you are making a wise decision, you must do your homework. Visit the showrooms and ask your questions. Ask the representative(s) to explain things in a way that you understand and make sure things are in writing. Sign your contract only when you are comfortable with all aspects of the deal. If you are feeling pressured to sign, don't. 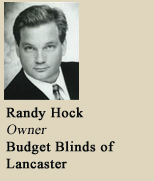 I am considering new window treatments and have looked at a variety of options. One that I keep coming back to is shutters. While I really like their looks, I don’t know much about them. What can you tell me to help me make my decision? Shutters are and will always be a mainstay in popular window coverings. They bring elegance and class to any room and any décor. Shutters are energy efficient and also add value to your home. So here are some popular questions about shutters that can help you decide if shutters are the right choice for your home. What are shutters made of? There are 3 types of shutters—wood, faux wood, and plastic. The wood shutters are usually made from American basswood which is a very dry wood. The faux wood is made from medium density fiberboard (MDF) and then is coated with a plastic wrap. The plastic is usually a hollow core plastic material. What are some of the options that come with shutters? Shutters do have a wide range of options. Louver size can range from 1 ¼” to 4 ½ ”, mounting options with different trims, hidden tilt bar, and stains and colors all give a personal touch to the shutter. And yes…they do come with remote control. I have tilt-in windows—can I still have shutters? Yes. There are a couple of options that allow the tilt in window feature to work. The easiest one is to do an outside mount. This would mean that the shutter would be mounted with our trim and would not impede the movement of the window tilting in. The other option is to do a direct mount. This would be a good option if you want to keep your trim. We apply the mounting hardware directly to your sill and therefore enable the shutter to open completely and allows the window to tilt down. It is always recommended that one of our professional design consultants come to your home to look at the installation to make sure there are no other issues relating to installation that need to be taken into consideration. What kind of stains and paints are available? There are many types of stains that come from the manufacturer. If you have wood floors or trim that you would like to match, usually the stains from the manufacturer can do the trick. If you have a hard to match color we can custom stain the shutter with a swatch from your stain. Paints are the same way. It is almost impossible not to find something that matches with your décor. If I want to keep the bottom portion of my shutter closed and open the top, what are my options? There are two options for this particular situation. One is called double hung. This means that a panel is split into two panels one top and one bottom. They are then hung individually and act as an independent panel. So if you want to keep the bottom closed for privacy you can open the top for light. The other option is to have a divider rail in the middle of the panel. This allows the louvers on the top of the panel to operate independently of the louvers on the bottom. This is the most common application and the most cost effective. Double hung also can have some light gap due to the window being out of square. Shutters are one of the most beautiful window coverings on the market today. They enhance every room and raise the value of your home. One thing to remember with shutters is that shutters are always made square and windows rarely are in square. So manage your expectations if you have inside mount shutters. Sometimes there may be light gaps along the side of the panel that are different from the top to bottom. That is normal for this type of application. Outside mounted shutters are easier to play with the square of the window, therefore, eliminating any light gap that isn't consistent. In the central PA area inside mount shutters are very popular with the fact that we usually have good depth to our sills.